Rhinoceros' Horns are much esteemed among the Mahometans, on account of their being considered a powerful antidote against poison. They are in general about 12 to 15 inches long, and from 8 to 6 inches in diameter, though sometimes (rarely) 10 inches in diameter, and near 24 inches long. A good sized born, sound, and not broken at the point, is worth from three to four pounds sterling. At the base they are commonly of a brown or olive colour, though occasionally grey, and sometimes nearly white : they are nearly straight, having a very small curve, inclining upwards with a sharp point. 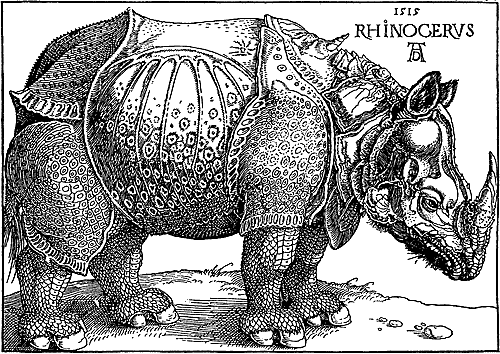 The horns of the Rhinoceros have not that interior spongy substance contained in those of other animals, but are entirely solid : they are made into drinking-cups and snuff-boxes. Rhinoceros' Hides are in great demand for making targets or shields; when prepared, they are proof against the stroke of a scimitar; they are of a variegated colour, and when polished, very similar to tortoise-shell. At Surat they make the most elegant targets of these hides, and stud them with silver-headed nails. These will fetch from 30 to 40 rupees each, and are much sought after, particularly in Arabia.